This year we’ve add a musical twist to Paw Palooza that will get your furry friends in the groove. Hyannis Sound and Cape Harmony will be performing at 11:30 both days of the festival with mini concerts to follow as a tribute to fallen Yarmouth Police Sergeant Sean Gannon. Get excited as performers from Hyannis Sound and Cape Harmony will be at theultimate festival for dogs (and their humans)! Joining us to kick off the first day of Paw Palooza, Saturday July 15, Cape Harmony. Based out of Hyannis, Cape Harmony was founded in 2006 as an all female acapella group. 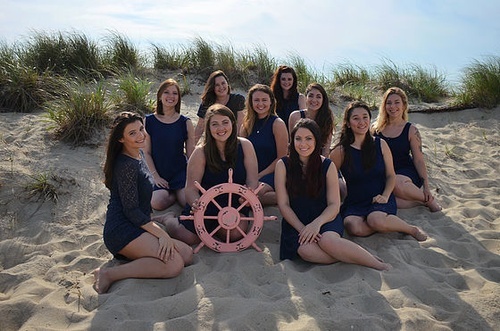 Made up of ten girls from across the country who spend their summers living on the Cape and performing a wide array of cover songs, Cape Harmony performs weekly on Mondays, Wednesdays, Thursdays, and Fridays. Hyannis Sound, founded in 1994, is an acapella arrangement of ten male singers who perform all over the Cape. The young men strive to not only gain experience for themselves, but to also influence the younger generations of performers. Hyannis Sound has recorded 12 albums to date as well as performed at Fenway Park. Hyannis Sound will be in attendance on the second day of the festival, Sunday July 15. Both acapella groups have been kind enough to donate their time and talent to Paw Palooza. Singing the National Anthem both Saturday and Sunday, with pop-up performances around the festival, Hyannis Sound and Cape Harmony will be collecting donations in honor of Sergeant Sean Gannon. All proceeds will be donated to the Sean Gannon Memorial Foundation. Thanks to the Boston Herald for the great feature on Paw Palooza. One of Yarmouth’s most popular events, now in its third year, is Agway of Cape Cod’s Paw Palooza, the Cape’s largest dog festival, this year from July 14-15. This extravaganza benefits the Cape’s two largest animal shelters, the MSPCA in Centerville and the Animal Rescue League’s Brewster shelter. The focus is on helping animals — and having fun — as in a radar run to see how fast your dog is (bragging strongly encouraged), puppy facials for dogs that love to be pampered and the extremely popular Dock Dogs jumping competition, a great event to enter your dog or to just cheer on the jumpers. While some of the dock dogs are master jumpers, novice dogs are welcome to compete. The massive festival also includes a puppy pool pavilion; a “Doggie University” tent; a caricature artist; a lure course; an interactive agility course; a puppy spa zone with doggie massages; a raffle; a vendor fair with nearly 100 local and national companies; a doggie kissing booth; “Pupcasso” art-making for pups; face painting; a Kids Zone; food trucks; and tons of unique activities for dogs and their families. Admission is $7 (no charge for kids 12 and under). Oh, howl yeah. It all takes place at Dennis Yarmouth High School (210 Station Ave., South Yarmouth) on July 14 from 9 a.m. to 6 p.m. and July 15 from 9 a.m. to 4 p.m. The event is totally family friendly. Learn more at pawpaloozacapecod.com. In spite of the fact that Retractables are “use at your own peril” items, most people are totally unaware of the dangers. Retractable leashes cause thousands of injuries to people and dogs– mostly rope burns, cuts and eye injuries, but even amputations. It’s easy to see the potential problems when an unpredictable dog circles the leash holder and takes off. If the 2 legged is lucky enough not to get his legs pulled out from under him, he’s still got a nasty rope burn or cut leg. The leash wrapped around a finger while the 65 lb Lab lunges after a squirrel can easily sever the finger. A lot of my clients have Retractables and thousands of times I’ve been asked, “What do you think of retractable leashes?” My response is to hand the dog owner the retractable and say, “I’m your dog,” holding on to the end of the leash as I walk across the room, extending it as far as it will go. Then I say, “OK, I’m Bowser, in the middle of the street and a car is bearing down on me. Reel me in! Save me!!!! !” 90% of the time I would have been smushed by the car as the dog owner was vainly trying to grab the cable and pull me in. Then I’d say, “OK, let’s see if we can save your next dog from the same fate,” and practice using it effectively. Retractables are one hand devices. Period. Reach forward as far as your arm will go, press the lock button and pull Bowser toward you, extending your arm back as far as possible. Then, release the lock button as the retractable is reeling itself in as you are reaching forward again, locking and pulling back. Repeat this 2 or 3 times depending on the length of the leash. Bowser will have been reeled in and safely next to you in about 3 seconds or less. Retractables are not great devices to use on busy sidewalks or in crowds. Even if you lock it at the length of a 4 ft leash, the hand holding it is useless for anything else. It is bulky and heavy, as opposed to a leash handle which you can slip around your wrist. However, Retractables are great for the untrained dog (can’t be trusted off leash) to get more exercise on walks in uncrowded areas. I’d suggest that you attach the Retractable to an “easy walk” harness which will greatly reduce pulling and the likelihood of any injury. Attaching it to a collar could cause a collapsed trachea if Bowser lunges the length of the leash after a squirrel, or whatever other tempting distraction catches his eye.